Horse racing excitement in the center of your hand...and they’re off! Study the mounts, place your bets and listen to the pounding hoofbeats as they come up the backstretch! 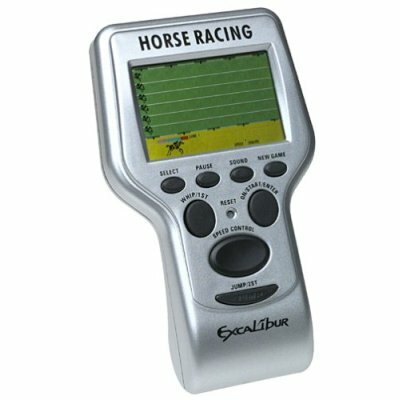 Realistic horse racing action is packed into this handheld computer game with color screen, sound effects and vibration. Control your horse as a jockey, or bet as a spectator. 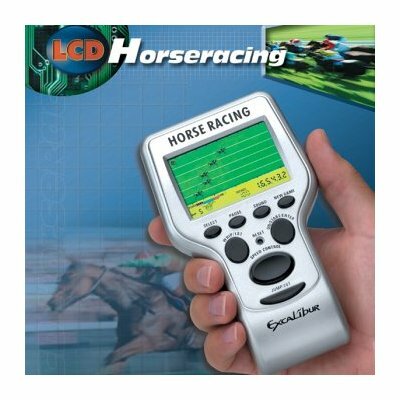 Hear the hoofbeats and the bugles anywhere you take the LCD Horseracing! Choose between two exhilarating games. Climb into the saddle as the jockey and feel the track vibrate beneath your mount’s hooves as you maneuver your way past the other horses! 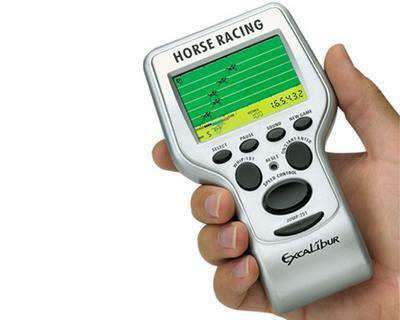 Or pick the winners with a big bankroll!Three levels of difficulty, exciting fence-jumping, sound effects, vibrations and clear, colorful display make LCD Horseracing your best bet for fun! Three difficulty levels in your choice of traditional race or steeplechase. Select from five bankrolls up to $3,000 for betting. 6x3x2". Uses 2 AA batteries, not included. Ages 7 and up.